As part of our advent activities we are having 3 theme days (one each week). Last week we had penguin day, today was frozen day and next week we will hopefully do snowman day. I’ll post about penguin day first and hopefully get round to frozen later in the week. 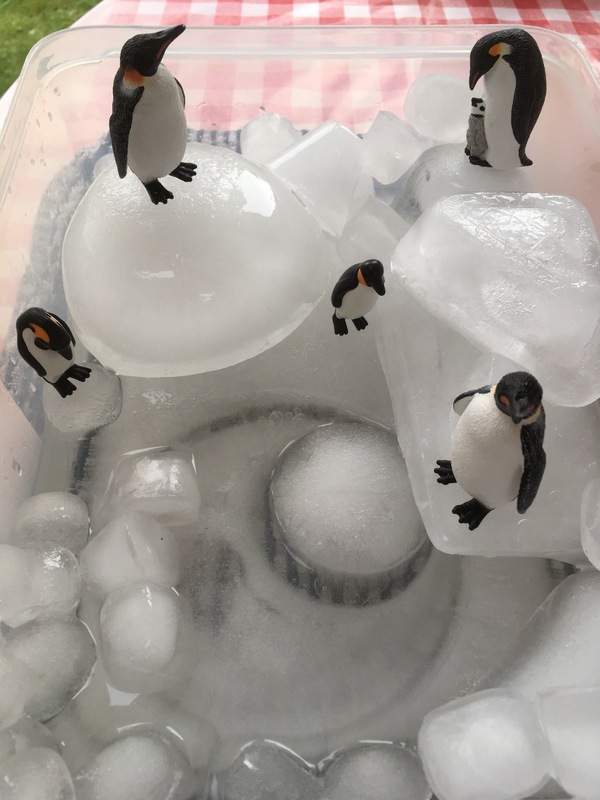 We started with penguin day as we did our first penguin day a couple of months ago – I still had the small world box in my freezer and wanted the space (and the box) back! 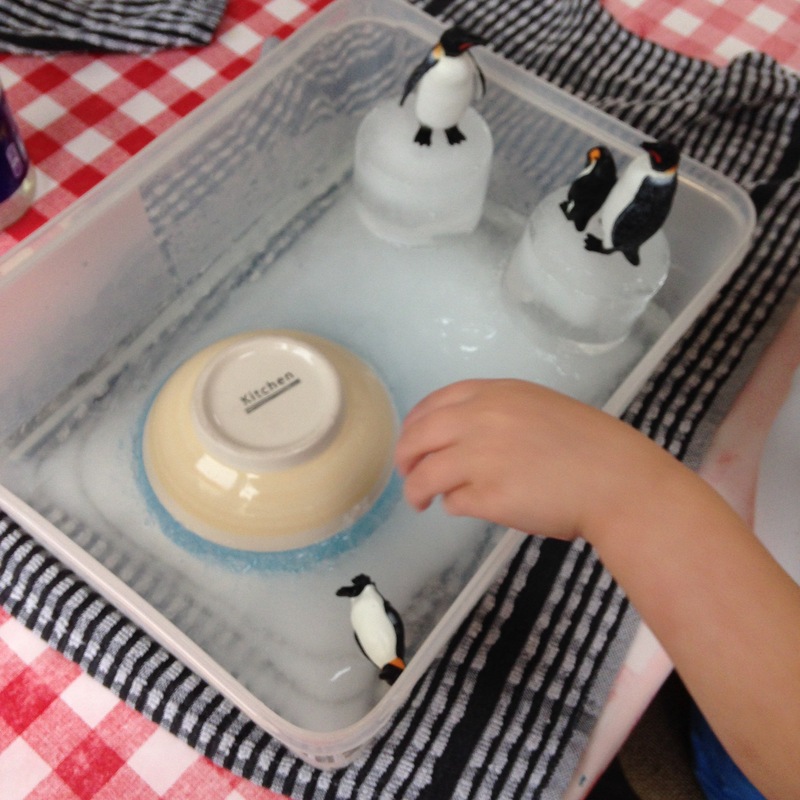 As we did our last penguin day not so long ago, we stuck to the simple activities we enjoyed last time. 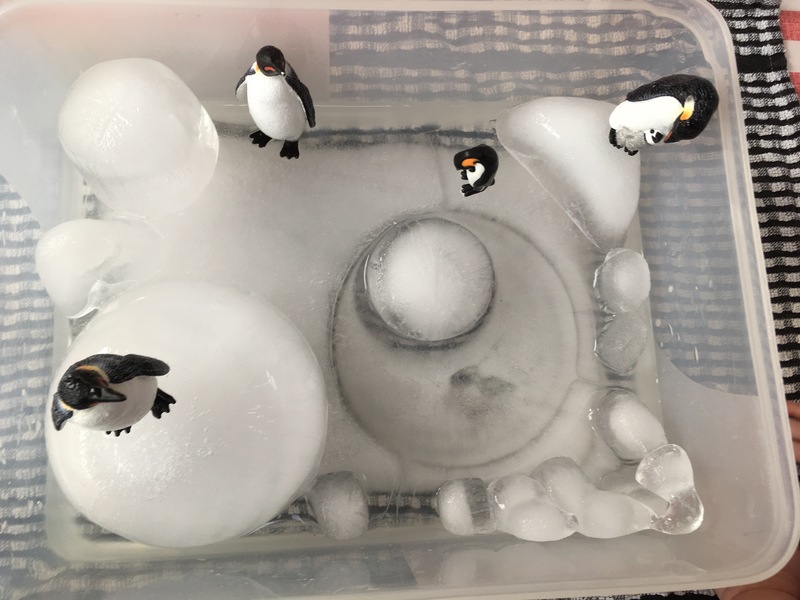 I originally made the icy small world for our first penguin day. I filled the box half way with water and put a bowl in to make the water hole. In hindsight I wouldn’t use a ceremic bowl with a rounded bottom again as it got stuck in the ice and I had to wait a long time for it to melt! I think if I was making it from scratch again I would put slightly less water in the large box and then just put lots of extra ice blocks around the sides, and maybe use tap water to create a water hole. It’s amazing the difference a few months make – little monkey was much more able to join in with the icy play this time round and really enjoyed playing alongside her brother. 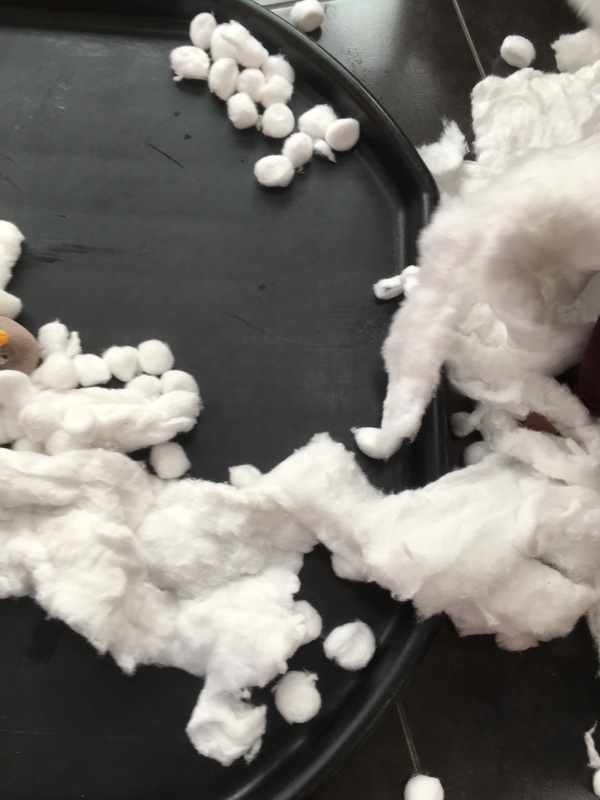 As well as the icy small world we also had a snowy scene in the tuff tray made of cotton wool. 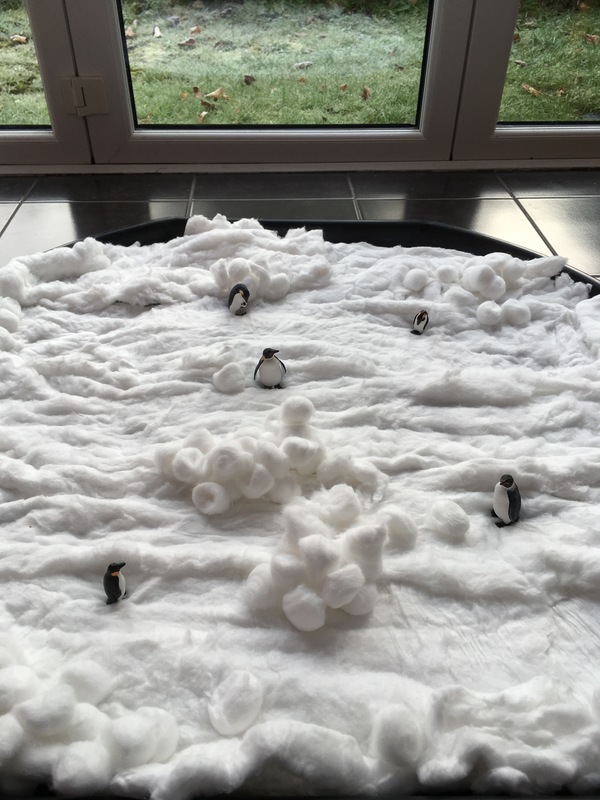 Bobcat enjoyed taking the penguins to and from the cotton wool and the ice, drying them off from their dip in the water. He also liked lying down in the soft cotton wool. As soon as little monkey got near the cotton wool she immediately started tearing the big sheets into long strips. Within seconds the lovely snow scene had turned into a scene of destruction, which did not particularly impress bobcat! 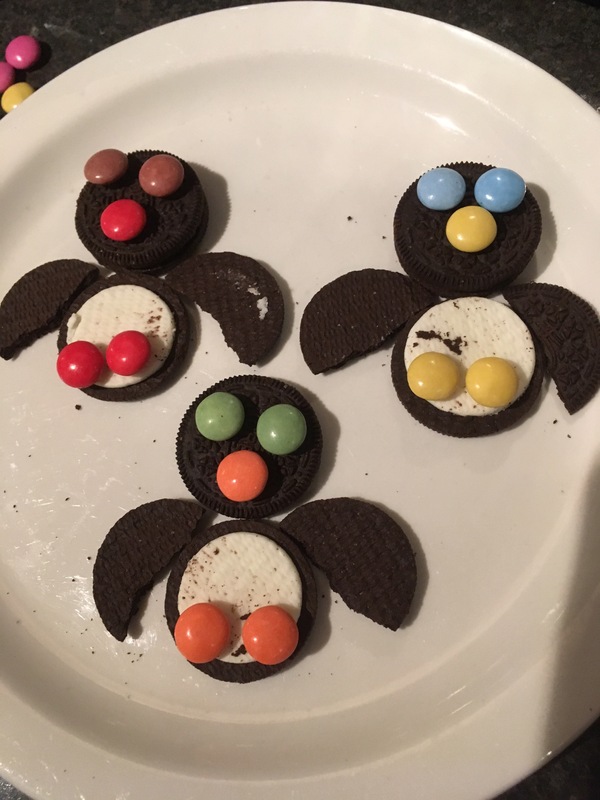 We didn’t do any penguin crafts this time round as we’d kind of exhausted that on our first penguin day, but we did make The Very Busy Kindergarten Classroom’s Oreo penguins. And of course we watched Happy Feet! Penguin day was lots of fun!